Description For a general introduction to cause mapping, see root-cause-analysis.php. This cause map deals with a manufacturing problem. Too many integrated circuit chips were failing. Inspections showed that the metal lines were too narrow. The problem or primary effect is shown on the left in red. Color is not necessary in cause mapping, but it is helpful to highlight the main problem. In this cause map the evidence boxes are shown in purple to distinguish them from the causes. You read this chart from left to right and add the words "was caused by" at each line. For example, "Metal was over etched" was caused by "Temperature of etch incorrect" or "Time in etch incorrect" or "Etch mixed incorrectly" or some combination of these. 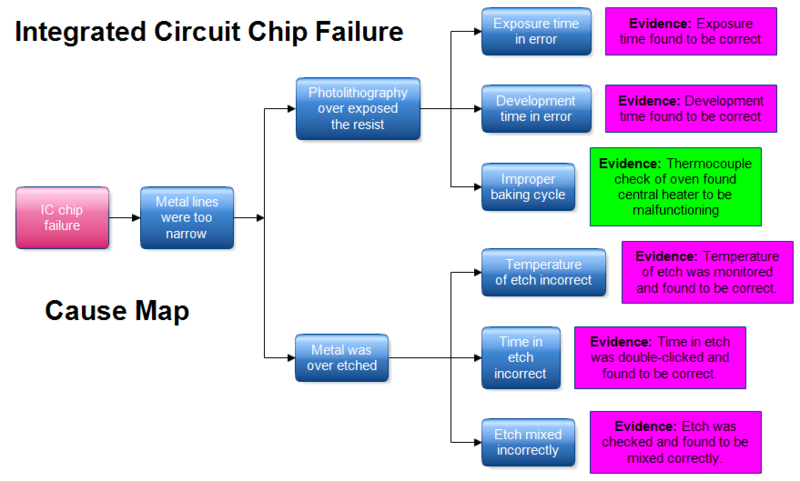 By checking all the possible causes, it was found that the oven which baked the photoresist was malfunctioning and that caused the metal lines to be too narrow and the IC chip to fail. Once RFFlow is installed, you can open the above chart in RFFlow by clicking on cause-map-metal-etch.flo. From there you can change the text to reflect your problem. It is often easier to modify an existing chart than to draw it from scratch. To draw this chart without downloading it, run RFFlow, click on the More Shapes button and add the Cause Mapping Stencil.